Clean and seal glass for lasting clarity and protection! 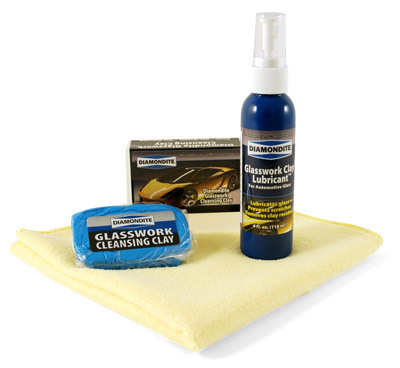 The Diamondite Glass Clay Bundle gives you the ability to deep clean your vehicle’s glass to create unbelievable clarity. Remove bugs, films, tar, industrial pollution, and more from glass to create a perfectly clear view. You never know how dirty your vehicle’s windshield really is until it rains. Then all the oil becomes apparent and the wipers smear the bugs and dirt that have baked on your windshield for weeks. It’s no wonder that more auto accidents occur in the rain. The Diamondite Glass Clay Bundle enables you to clean glass below the surface to remove embedded dirt, oil, bugs, tar, and industrial fallout. Contaminants that cannot be removed with an ordinary glass cleaner can be removed with the Diamondite Glass Clay Bundle. Diamondite Glasswork Clay is an elastic clay resin that cleans out the microscopic grooves of glass to leave it incredibly slick and thoroughly clean. Glasswork clay cleans by gliding over the glass on a bed of lubricant and grabbing contaminants that are bonded to the glass. Clayed glass will be incredibly smooth, clear, and clean. With a 70/30 blend of polyester and polyamide,you can use these microfiber detailing cloths for drying, buffing, or as a finishing wipe down. Microfiber is designed to be light, strong, super-absorbent and quick drying. The fibers are non-abrasive, and are woven so tightly that it’s absolutely lint free and extremely durable. Unbelievably, these ultra-tough fibers are engineered to absorb seven times their weight in moisture. How important is visibility to your driving safety? It is imperative. The Diamondite Glass Clay Bundle deep cleans and seals automotive glass to maximize your visibility and you safety every time you drive. Check out our other state-of-the-art Diamondite products for more excellent glass, plastic, and vinyl care solutions. Clean the glass with a glass cleaner (Diamondite Perfect Vision works great!) or wipe it down with a damp microfiber towel to remove any loose debris. Mist a small section of glass with Diamondite Glasswork Clay Lubricant. Rub the Diamondite Glasswork Clay Bar across the wet area. Use only enough pressure to maintain contact with the glass. You will feel and hear the clay grabbing. This is normal. Continue rubbing until the clay glides freely. Wipe the glass until dry using the included Microfiber Towel.